Located just north of Yellowstone National Park, Absaroka-Beartooth Wilderness is known for it high peaks and alpine plateaus. 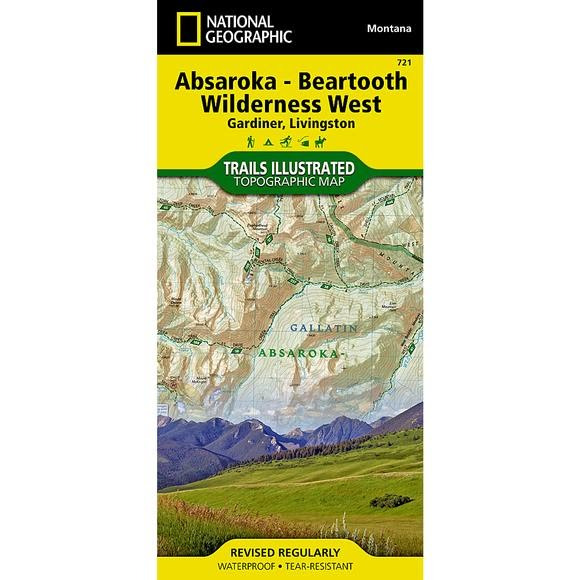 Experienced and novice outdoor enthusiasts alike will marvel at National Geographic's Trails Illustrated map of Absaroka-Beartooth Wilderness West. Expertly researched and created in cooperation with the National Park Service, U.S. Located just north of Yellowstone National Park, Absaroka-Beartooth Wilderness is known for it high peaks and alpine plateaus. Experienced and novice outdoor enthusiasts alike will marvel at National Geographic&apos;s Trails Illustrated map of Absaroka-Beartooth Wilderness West. Expertly researched and created in cooperation with the National Park Service, U.S. Forest Service and others, the map delivers unparalleled detail of the western half of the wilderness. Coverage includes many popular recreation areas, such as the Gallatin National Forest, Absaroka Range, East and West Boulder Plateaus, Yellowstone and Boulder Rivers, Mammoth Hot Springs and the northern part of Yellowstone Park, Paradise Valley and part of Custer National Forest. Let the map guide you off the beaten path and back on again with clearly marked trails, shown with mileage markers and labeled according to designated use, whether exploring on foot, horseback, mountain bike, ATV, motorcycle, skis or snowmobile. Your navigation will be aided by the map&apos;s contour lines with elevations, labeled peaks, summits and plateaus, water features, glaciers and snowfields, areas of wooded cover and color-coded boundaries between different land management agencies as well as a complete road network to lead you in and out of the area. Recreation features pinpointed include campgrounds and campsites, public cabins, trailheads, interpretive trails, fishing holes and wildlife viewing areas. QR codes provide quick access to hunting and fishing regulations and licensing.